“Arthur C. Clarke talking about satellites or Jules Verne’s trip the moon – these things have been very influential in imagining what might be,” Professor Prawer says. Here are five ways researchers are pushing the boundaries of scientific discovery – turning science fiction into science fact. In presentations on the the bionic eye, Professor Prawer, a self-described sci-fi fan, uses the story of Geordi La Forge, the blind character played by Levar Burton in Star Trek: The Next Generation. “Geordi wears a visor and that picks up all sorts of signals, from visible light to exotic particles,” Professor Prawer says. “Those signals are communicated to his brain by neural implants he has on either side of his head on his temples. Originally funded through a AU$50 million research grant from the Australian Research Council, and led by Bionic Vision Australia, the bionic vision system includes a pair of special glasses that send signals or images to a device placed on the retina. 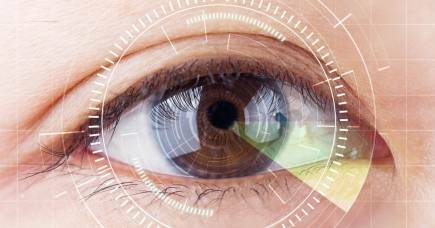 The electric signals stimulate the optic nerve and communicate information to the brain. What is special about the approach used by Professor Prawer’s team is the use of diamonds to restore high acuity vision to blind patients. Development of the diamond eye has now been taken up by University of Melbourne researchers in collaboration with iBIONICS, a Canada-based company commercialising the diamond technology. The company plans to start clinical trials on patients with a common form of inherited blindness in the hope of restoring their vision to be better than the limit of legal blindness. 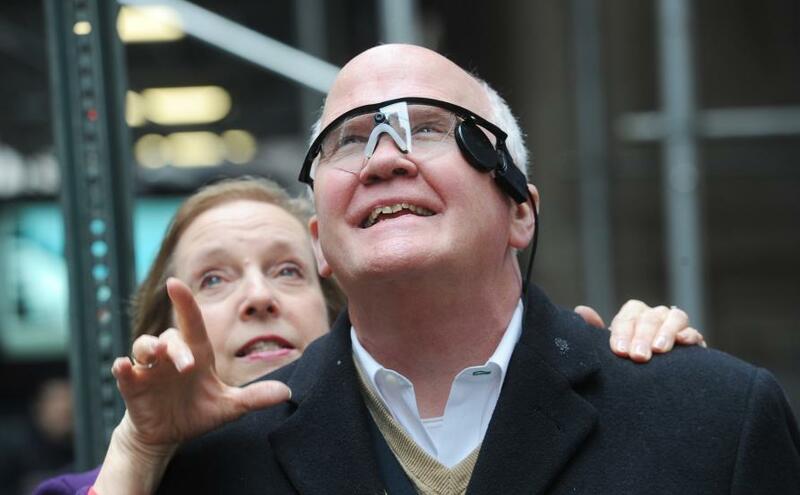 “The immediate stage is to make devices that help people be able to see again,” Professor Prawer says. But the eye is also the gateway to the mind, and the next phase is to use such devices to better understand the brain from a scientific point of view, and to be able to ‘talk’ directly to the brain. “Deciphering the code that the brain uses to store and communicate information; that is one of the great remaining mysteries of our age,” he adds. 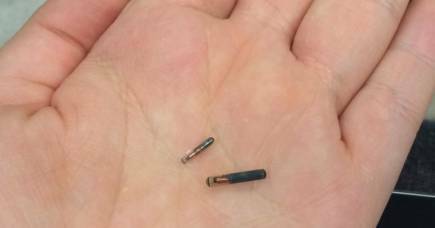 Ms Heffernan is studying biohackers, people like her who choose to wear what she calls “insertables” – devices, such as microchips or magnets, implanted inside the body for non-medical purposes. They are using insertable technology to pay for lunch or sense faraway earthquakes. Engineers have yet to invent talking cars or flying taxis like the ones you might remember from Batman, Knight Rider or The Fifth Element. 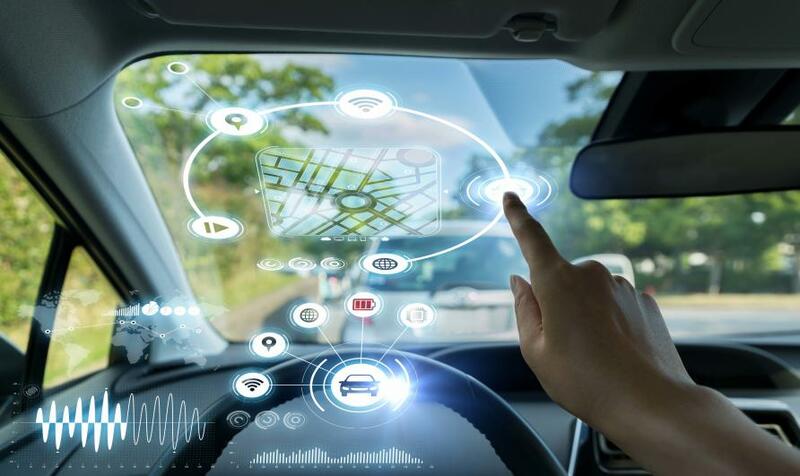 But in recent years, major technology companies from Tesla to Uber have promised a near-future in which driverless cars revolutionise our transportation networks. That doesn’t necessarily mean your kids won’t need driver’s licences, says Professor Majid Sarvi, the chair in Transport Engineering at the University of Melbourne. Professor Sarvi, who led a team this year that tested an autonomous mini-bus in Melbourne’s inner north, describes the technology as very useful and a great step forward “but still a long way to becoming part of our everyday life”. Creating a driverless car is one thing, but the real trick is in creating an infrastructure where driverless cars can co-exist with traditional vehicles and pedestrians. Professor Sarvi’s autonomous bus test was part of an ambitious research project, the Australian Integrated Multimodal EcoSystem (AIMES), which will collect information about a 4.5 square-kilometre section of Melbourne’s inner north over 10 years. Researchers will place sensors on traffic lights, light poles, cars and more to study ways to make transport safer, cleaner and more sustainable. Driverless cars will be an important part of the future. But the research has other immediate and short-to-medium term implications too. 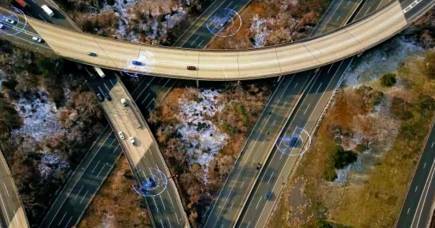 Professor Sarvi and his team want to help governments create an intelligent transportation system, one that connects buses, trains, trams, pedestrians and cars into an integrated network that accounts for real-time variables, such as the weather or crowds. “Today, when you’re using public transport, you don’t know how many people are going to be on the bus, whether you’re going to get a seat, whether you should walk instead,” he says. 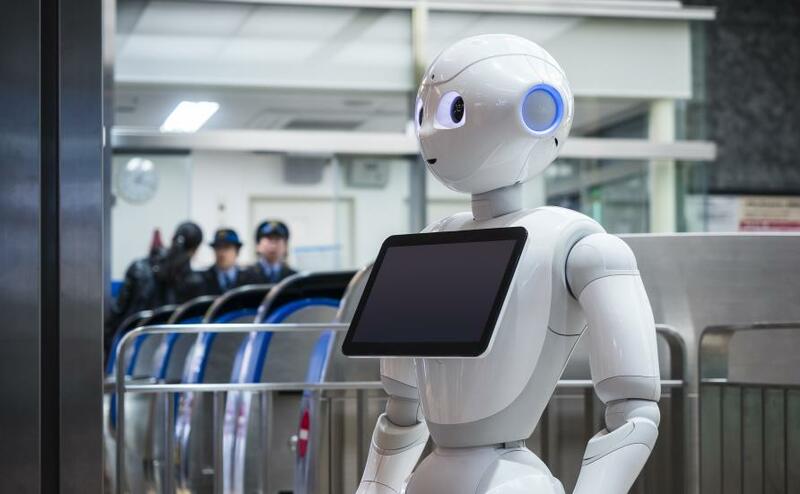 Associate Professor Denny Oetomo’s work with the Melbourne Robotics Laboratory focuses mainly on humans’ physical interaction with robots, rather than the emotional or psychological human-robot relationships so often portrayed in film and television. Professor Oetomo’s work on understanding the role of tactile - or touch - information in realising the highly dexterous skills we see in human hands is part of a larger, ambitious vision to restore the sense of touch to people who have lost limbs. Various University of Melbourne teams are working on the technology that can send signals – such as pressure, contact, texture or temperature – back to the brain. 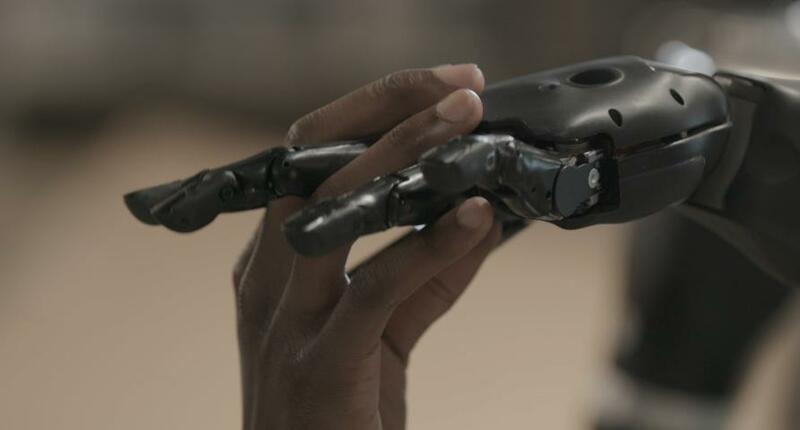 Another Robotics Laboratory project will see clinical therapy robots helping stroke survivors with their rehabilitation. Some stroke patients need thousands of hours worth of physical therapy that human therapists simply can’t provide, though a robot can. It also provides other previously unavailable capabilities, such as keeping pertinent information on the patient’s progress. “It’s slightly less blue sky than neuroprosthetics, which tends to capture the imagination because of the computer-brain interfacing, and people think of that as very high-tech, whereas with physiotherapy, they go, ‘Oh yeah, massages’. 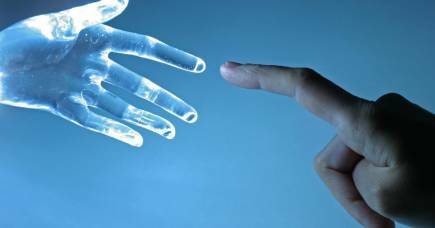 Science fiction has long toyed with the line between robot and machine, and with ways that technology can be used to change and augment the human body. The 1987 film RoboCop tells the story of a murdered police officer who is revived as a superhuman cyborg. In the 1970s, US television series The Six Million Dollar Man and The Bionic Woman portrayed people whose bionic implants gave them superpowers. 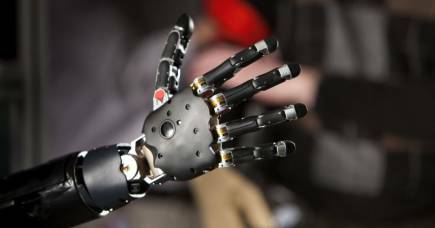 Today, Australian researchers are working on what has been described as the “holy grail” of bionic technology. Professor David Grayden, of the Department of Biomedical Engineering, is part of a team of scientists at the University of Melbourne, Royal Melbourne Hospital, the Florey Institute for Neuroscience and Mental Health, and other partners, to develop “the bionic spine”. 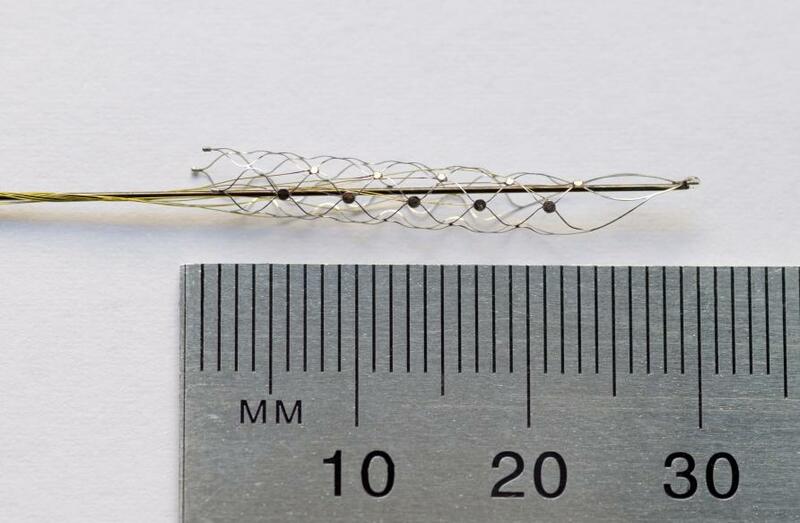 It’s based on a device called a Stentrode, which is a small stent with electrodes attached to it. The Stentrode can be inserted into a blood vessel next to the brain’s motor cortex and would help paralysed patients control robotic limbs with their thoughts. The Stentrode is currently being developed for its first in-human trials, while researchers are designing algorithms to decode neural signals from the brain. It’s amazing technology that could see paralysed patients walk again. But Professor Grayden says real-life bionic implants still pale in comparison to their fictional counterparts. “I think that the sci-fi genre shows what may be possible, but usually it results in people thinking that some developments will happen faster than they do and better than they do,” he says.